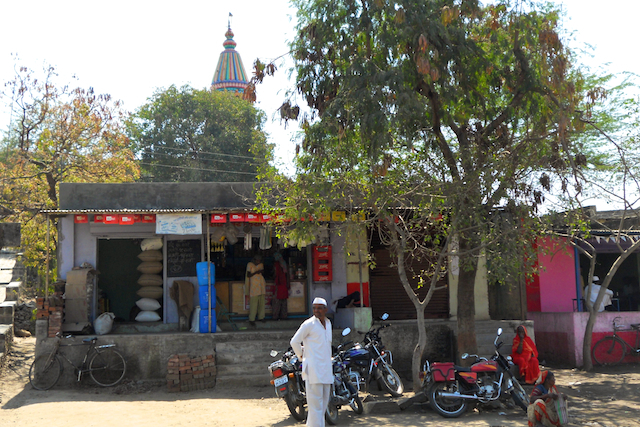 During our AstaVinayak (Eight Sacred Ganapati Temples) tour, we stopped at a roadside eatery in rural Maharashtra. After a simple meal (roti & sabzi for us, yogurt and rice for Meera), I ambled over to the village square. The Devi temple in lavender/pink stood out. As I walked around taking pics, I noticed this father and daughter resting behind the temple. Even though the father is sitting away from his daughter, his body language tells you how much he dotes on her. You see? Love how she is relishing that banana – the simple joys. Notice her silver anklets and hair tied in two “jutus”. Reminds me of baby Meera. The mother was standing right next to her (see this pic taken a few seconds earlier), but I thought the father-daughter made a better opener. Agree? The only other shops in the village. Two Hero Stones flanking the steps to the temple. These were traditionally carved to honor villagers fallen bravely in battle. 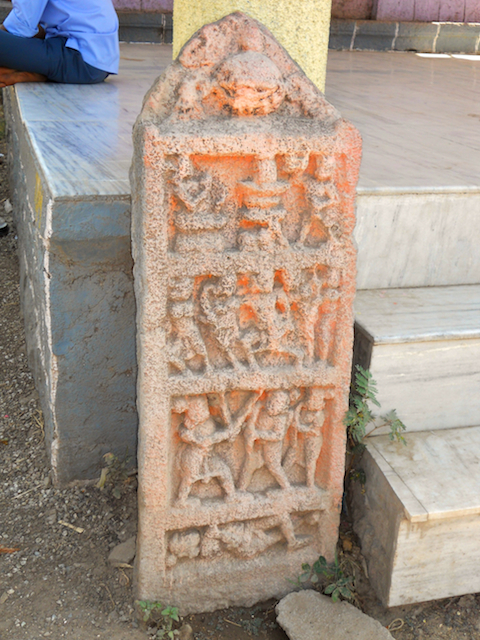 The stones typically depict the person in service of Shiva (notice linga in top panel), battle and other scenes. This region of Maharashtra saw some brutal massacres by the Muslim hordes of Alauddin Khilji in the 13th century. Conflict continued for the next 200 years as the Muslims tried to consolidate their powers in the Deccan. These stones likely pay tribute to some of the fallen heroes. Crudely carved stone in front of the temple. Methinks this is a Sati Stone. Considering the nearby hero stones, it is likely this too was from the times of the Muslim conquests (12th – 15th century). A couple of women committed Sati near here. Before they walk onto the pyre, they would dab their feet (and hands) in vermillion and make prints in front of the temple. Family members would later etch these in stone. It is common to see similar hand prints. While I am glad that practice has ended, we should remember the sacrifice and courage of these women. This practice of sati was started by the Maharani Padmini of Chittor. After their capital had fallen to the Muslims, rather than be forced as brides of the invading Muslims, en masse the women jumped to their deaths. Later women took to immolating themselves on the funeral pyres of their husbands, rather than be taken to serve in a harem. A few stones in a sleepy village tells us so much. 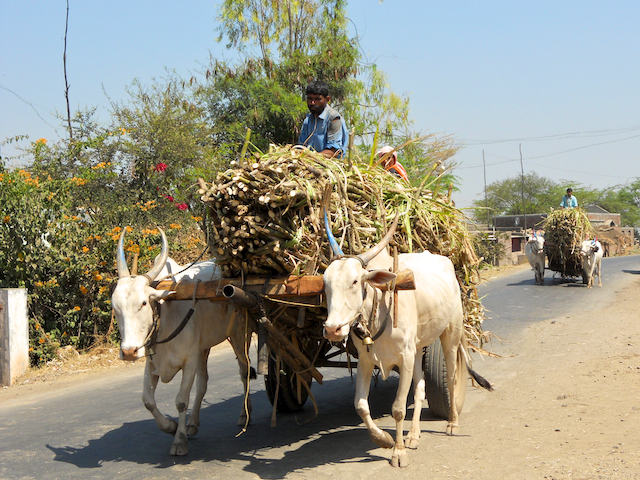 As I walk back to the bus, bullock carts loaded with sugarcane creaked and groaned their way to a nearby sugar factory. See more pics of bullock carts transporting sugarcane. 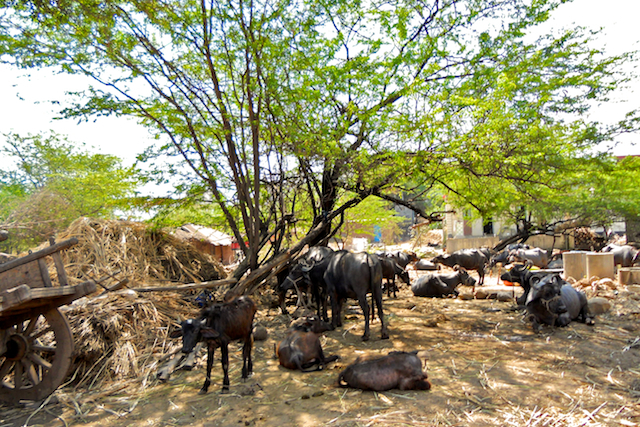 In a grove next to the eatery, a herd of water buffaloes ruminated. Meera was intrigued by these gentle beasts, particularly the calfs, but also terrified of getting nearer. 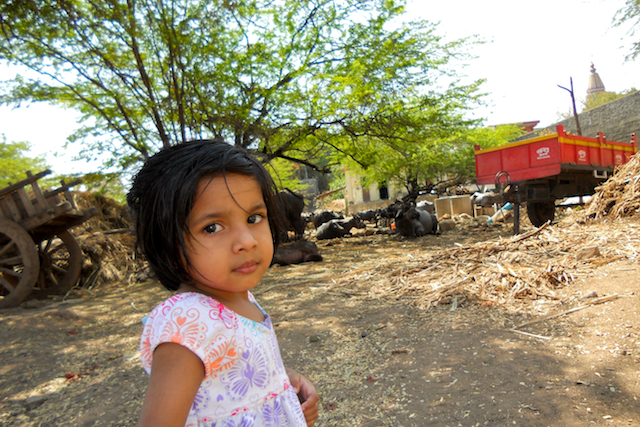 We had a short trip to see rural Maharashtra when we visited Shridi, driving from Pune. We also stopped at one of the Asta Vinayak temples on our way back. The whole layout of the temple is slightly different from our Tamilian temples. You should visit Shridi if you havent visited it before, the next time you and family are in India. Its a surreal experience. Actually, we recently visited Shridi as well as Shani ShingaNapur and it was a fabulous experience. Loved all aspects of it. This reminds me to post pics from our Shirdi trip. Good point about the layout of the temples being different than in TN. Tamil Nadu is where the South Indian (or Dravidian) temple architecture developed and you would rightly expect to see amazing examples of flourishing temples. These asta vinayak temples are essentially in the “Deccan” region of Maharashtra, where the important battles in the 12th century and later were fought with the barbaric Muslim occupiers/invaders. Most of our ancient heritage was destroyed, including fabulous examples of temples. These temples survived in remote corners as small “gudis”, which were later developed during the times of the Peshwas, primarily Ahilyabai holkar, who commissioned the restoration and expansion of some of these temples. Because of this reason, the layout of these temples do not conform to the traditional temple layout and does not also include all the various components of the traditional temple. But great point which I need to study further. That is some history there. This is written by an American writer, with roots from Kerala, born and raised in Ethiopia and who did part of his medical school from Chennai( previously called Madras ) the capital state of Tamil Nadu. I would also recommend to his books – My Own Country, The Tennis Partner and Cutting For Stone. Beautiful article; Thank you for sharing that. Will look up the other books. Very nice artcle. may i know the name of the village and near which ashtavinayaka temple. Good Posts!Thanks for writing about village. I am also from a small village. What we call villages are the real repositories of our Hindu / India culture. A blessing to have lived there. Happy New year to you M&M. Nice write up.. Yes the Ashtavinayak tour is really refreshing I love rural Maharahstra and its people so innocent yet so full of life. Enjoying simple pleasures of life. Meera is so pretty. Those eyes speaks volumes. Thank you Shilpa for sharing your thoughts on Maharathtra. Yes, the vilages are where the real Bharat shines through. Such trips are my favorite. I will take this any day than a day at the beach. Hope the New Year is going well. Nice picture story. I am sure you and family enjoyed the trip. Meera is looking cute. 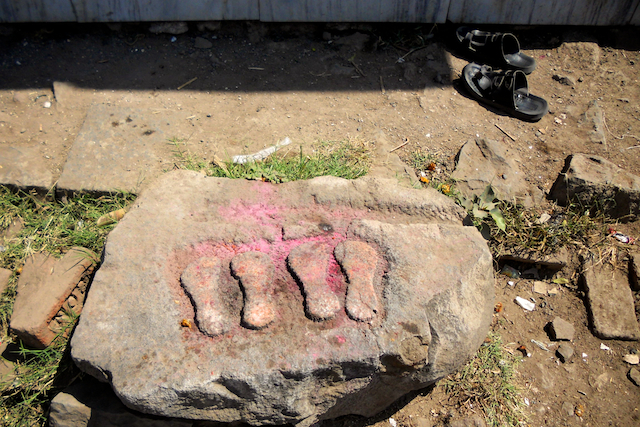 I have found a few of these amazing stones around Kaiga, North Kanara, while I was working there, they are called Veeragallu (stone for the commemorating the brave) and Satigallu (stone for commemorating the Sati’s). I am seeing sugar canes – Did you enjoy fresh sugar cane juice at the ‘gAN’ – place where they crush the cane and make jaggery? Yes, these stones are very common in rural areas of Karnataka. I think in the urban areas, they are simply removed to make way for roads and buildings (and Malls). And yes exactly, your kannada names are right one. I just translated them. We visited the Aurangabad region and loved it. Did you visit the Paithan area? What a heritage that area has. Thanks for the reply. 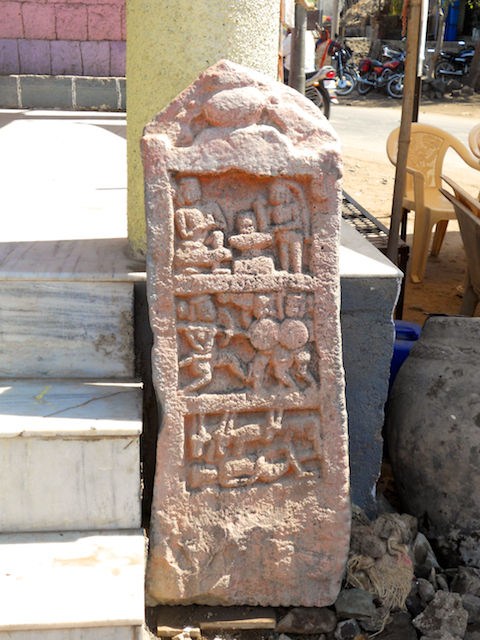 I was in Aurangabad for one year during which period, I had the opportunity to visit Paithan also . It is a nice place and the people are innocent and friendly. Hope you have visited Ellora also. I thank you once again for the article and the photos through which you have brought the real picture of Maharashtra. I was impressed with the Sant Eknath Maharaj’s Samadhi there. Very moving. Yes, we did spend a few days at Ajanta, Ellora and also Grihaneshwar (site of a Jyotir linga). You may enjoy this post on mine.